With Mother's Day being around the corner there is still time to get some shopping done for the mom in your life. Whether you're looking for a gift for your wife, mother, mother in law, sister or friend one of the places I would highly recommend is your local Shoppers Drug Mart. I've always loved shopping at Shoppers, for myself and for shopping for others too. There is something for everyone including that mom who has everything. Why not give her a giftcard to her favorite restaurant or an Itunes card so she can pick out some new tunes to listen to. The year before last my husband went to Shoppers for my Mother's Day Gift. He got me my favorite Sea Salt Caramel Chocolates along with a beautiful card and inside the card was an Itunes card because he knows how much I love music and there was also a Starbucks card because he knows I love my coffee! From May 4th until the 10th Shoppers is offering 20x the Optimum points when you spend $75 or more on selected cosmetics or fragrances. How great is that? Not only do you get a great gift, but you also get optimum points, which we all love and could use. 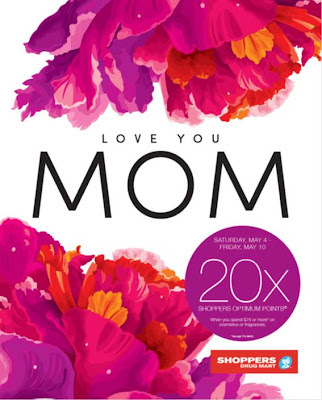 Be sure to check out your local Shoppers before you run out of time and also check out their Mother'sDay Guide book. This booklet includes all of our favorite cosmetic and fragrances from top name brands. You'll find new and exclusive products from brands like Essie Nail Lacquer, new and exclusive perfume from Adam Levine, Gucci Première Eau de Parfum that includes a free gift (just to name a few) and so much more! Disclosure: All opinions are my own. The products mentioned above have been given as part of a sponsored post through our ad network, SheBlogsMedia, for Shoppers Drug Mart.